Viruses have been a threat to computers for 20 years now. The phenomenal speed they spread is due to the ever increasing use of email and other internet based communication. Any organisation using computers should take steps to ensure their systems are protected otherwise they risk losing data or being unable to work for days. IT F1 can give advice on how best to protect your systems. We can clean viruses from your systems to get them working again quickly should you be unfortunate enough to suffer an infection. IT-F1 Ltd are proud to offer web site design services through our associated company Creative Jar who will give your business the web presence it deserves. One of the most exciting web based developments in the last few years, "Microsoft Sharepoint" is aimed at both the small and large business wanting an area to share information with staff, this can be company policy documents, order forms, current quotes, up coming events, boardroom bookings, holiday diary, announcements, the idea is that staff can be given read, contribute or design rights as required allowing a collaboration workspace to quickly become useable. Our associated company Creative Sharepoint are at the forefront of the development. Please ask for a demo. You don't have to have visited "dubious" sites in order to get spam or junk email. But if you've ever supplied your email address to a newsgroup, a mailing list or a directory, you may well become a target for spammers. If your email address appears on your own web site, you will almost certainly become a target. This is because spammers use automated systems to trawl round the Internet, harvesting all the email addresses they can find. They then add these email addresses to their mailing lists. They don't care if some of the email addresses are invalid - their spam will get through to plenty of people. The mailing lists get sold and re-sold - and you get more and more spam. If you try to "unsubscribe" your request will usually be at best ignored. At worst, you have told the spammers that your address is valid, and you'll get even more spam. 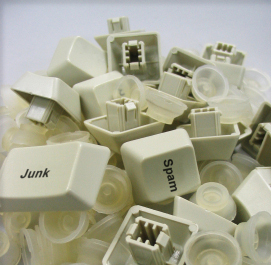 IT-F1 can help you find a solution which stops junk emails before they arrive at your computer. This software scans the contents of emails and can stop all types of email borne threats: viruses, worms and malicious macros and spam email, before the emails arrive at your computer. Updates happen automatically so that the latest spammers' tricks can't get through your defences. Protection from inappropriate content - the Internet is full of useful resources which can help make your business more productive. The downside is that there are a great many sites which contain offensive or non-work-related material which can clog your bandwidth, reduce worker productivity or leave the organisation open to prosecution. IT-F1 can help you select a method of "policing" your company's Internet usage that suits your usage policy. IT-F1 Ltd can offer you robust, reliable, always on high speed internet access through our partnership agreements with PIPEX, PLUS NET & DEMON INTERNET. ADSL (Asymmetric Digital Subscriber Line) works over a normal BT telephone line and offers download speeds from ten to potentially forty times the speed of a standard 56k dial-up modem. With ADSL, you can be online 24x7 and still use the telephone line to make and receive calls and faxes. Now ADSL2+ is allowing many more homes and offices to get broadband as it can travel further and sustain a higher bandwidth. Probably the ultimate internet connection. Speeds can be 1mb/s to a massive 40mb/s or more with a 99.9% uptime and equal upload and download speeds, no contention ratio (no sharing with anyone else) But at a price! While our ISP partners can provide very competitive rates for the install and rent of such lines they are only for a very few Businesses.